Android developers have reacted remarkably quick to the HTC One M9's introduction. Although many of you are yet to even touch the smartphone, its bootloader has already been unlocked, a functional custom recovery has been developed, and rooting is possible in a pinch! To show you how easy it is, we'll walk you through the steps involved in flashing TeamWin's custom TWRP recovery and rooting with SuperUser on the One M9. The only prerequisite is an unlocked bootloader, which you can learn how to do yourself in this tutorial. You need Minimal ADB & Fastboot. If you followed the tutorial for unlocking your One M9 bootloader, you already got this. If you don't, use this link and remember the folder where you installed it. While you're at it, download the HTC Sync Manager to get the drivers on your computer. Use this link. Download the custom recovery for your HTC One M9. Use this link and save the .img file in the same directory as the Minimal ADB installation. Download the SuperSU.zip file from this link. Enable USB debugging on your HTC One M9. This happens from the 'Developer options' menu in 'Settings'. If you don't see it, head to the 'About' menu and start tapping on the 'Build number' entry until you get a notification saying "You are now a developer". Now plug the One M9 into your computer. If the recovery file name is different, fill it in place of TWRP.img. Now, reboot your smartphone and connect it to your computer. Place the SuperSU.zip file on a easily accessible folder on your device storage. Power off the smartphone, wait 10 seconds, then hold the Power and Volume Down keys. When the white bootloader appears, choose 'Recovery'. Use TWRP to install the SuperSU .zip file. Just tap Install, choose the .zip file, and the app will do the rest. Reboot the smartphone when you're finished. 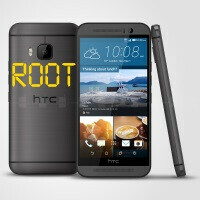 Use a root checker app, such as the free Root Checker from Google Play, to check whether the trick worked and your HTC One M9 is successfully rooted. Congratulations! can anybody tell me what is this S-Off thing ? i mean what is the difference ? i ain't pay a $25 for just making it!!! i dont know now but when i had htc rezound, s-off made OTA update possible without relocking the bootloader. with s-on, the device had to be relocked to receive OTA ICS from verizon. And then unlock the bootloader again to root it. i am sure there are other benefits too. I hope we can unlock the damn Samsung bootloader!